Do You Understand the Psychology of Internet Usage? Have you ever wondered how identity, relationships and behavior are affected by social media and online technology? The Master of Science in General Psychology with a concentration in Cyberpsychology & Cybersecurity – one of a few universities offering this specialized discipline – presents a scientific approach to how cyber interaction impacts human behavior. This degree goes further still by also exploring cybersecurity and issues of internet safety. Study how modern technology has shifted the landscape of our society, while gaining insight on the psychological processes, motivations and intentions behind our online interactions. Explore personality traits of internet users, examine how people engage in cyberspace and develop strategies that help improve human-technology interactions in social, interpersonal and organizational settings. 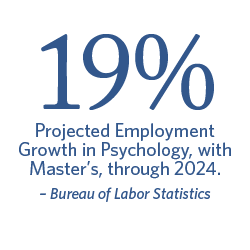 Work closely with respected psychology faculty, and study among like-minded peers committed to helping you develop professionally and personally. Presented from a Christian worldview, this online concentration is a gateway to doctoral preparation in science or applied psychology; and is supported by award-winning faculty in Virginia Beach. Explore the challenges and complexities cyber influences have on personal identity, relationships, careers, cyberbullying and cybercrime. Apply psychological theory, methods and research findings to the study of cyber behavior. Learn ethical principles and responsibilities associated with information systems security. Introduces basic concepts and vocabulary for pursuing additional training in cybersecurity policy and affairs. Examines issues such as: how does encryption work? What is code? What is a blockchain and what is critical infrastructure? Also, suitable for students not wishing to pursue a concentration or certificate but wishing to acquire familiarity with these issues. Historical development, current state, and emerging trends of psychology both as a profession and scientific discipline. An orientation is provided to the program to graduate study in the field, and to ethics in psychology. The integration of Christianity and contemporary psychology will be examined. Statistical methods and their application to psychological research. Surveys the collection, organization and analysis of data utilizing hypothesis testing. Evaluates various frequency distributions and measures of central tendency. An emphasis will be placed on the application of correlational and one-way ANOVA techniques. Continued graduate instruction in statistical methods and their application to psychological research with a particular emphasis on Multivariate ANOVA techniques. Prerequisite: GPSY 510. Surveys the range of research methods utilized in contemporary psychology with a primary emphasis on quantitative research including both experimental and non-experimental designs. Reviews the biological determinants and influences on psychological functioning with a focus on the structure and function of the central nervous system. Major theories, issues, data and research methodologies in social psychology. Current research literature on social perception, prejudice, helping behavior, and social conformity. Affective neuroscience, cognitive psychology and motivational psychology. Attention and perception, consciousness, thinking and reasoning, memory, language, and motivational factors in human and animal functioning. Human growth and development across the life span. Particular emphasis on the physical, social, cognitive, emotional, and spiritual growth of the individual with a review of current research. The integration of Psychology and Christianity. The history of the integration project, various models of integration in science and applied psychology, and emerging trends in light of classic and current scholarly contributions to the area. Application of psychological theory, methods and research findings to the study of behavior in the context of human-technology interaction. Have a minimum of a 2.75 GPA for all undergraduate coursework (3.0 preferred).